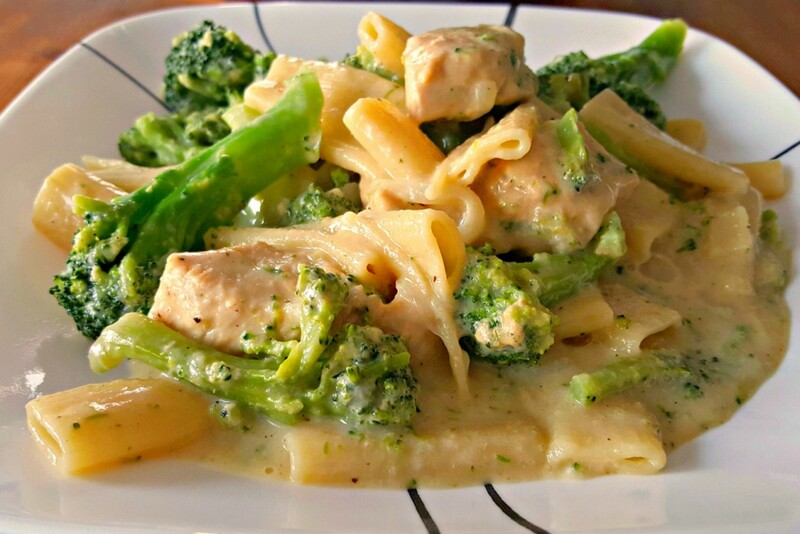 Broccoli and cheddar are the perfect combination! 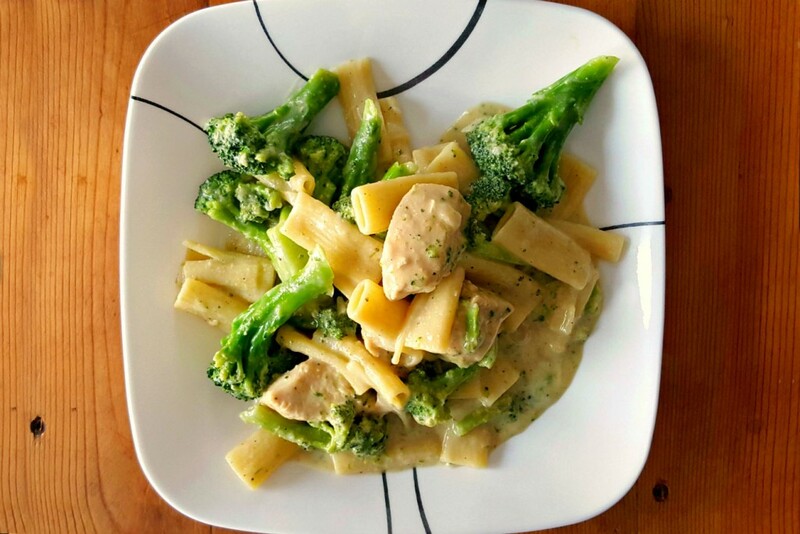 It’s also perfect in this Green and White One Pot Pasta aka Broccoli Cheddar Chicken Pasta; a one pot meal on the table super quick! I don’t know about you, but when I was growing up, I could would only eat broccoli if it was slathered in cheese. I’ve since grown up and love eating broccoli plain with just a little salt and pepper. I love it roasted in the oven with then tossed with just a little butter. Then there’s stir-fried with some ginger beef, or in soup, or…well, I just love eating broccoli now. It’s actually the broccoli cheese soup that inspired this recipe. 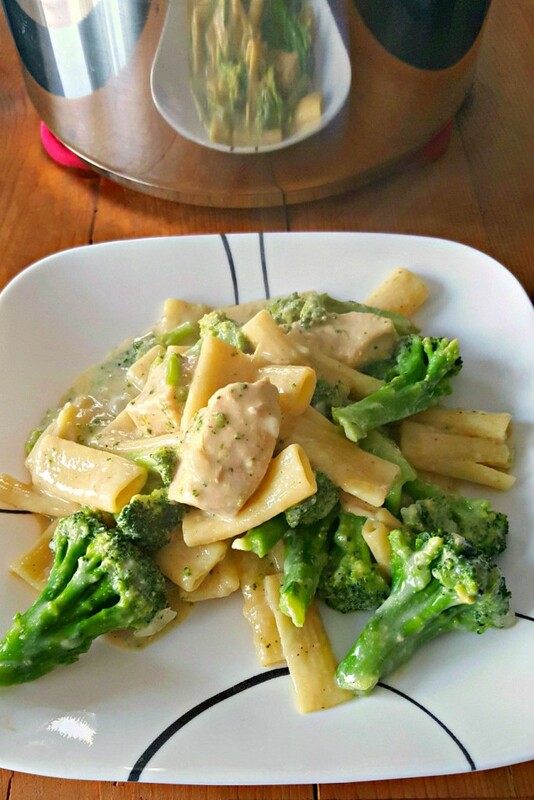 I wanted the delicious broccoli cheddar flavor to marry with some riggies and chicken for a one-pot meal. Cause, we’re all about the one pot meals lately. Well, *I* am all about the one pot meals lately. I cannot express how tiring it is to sit in the traffic in this area and come home to try to good a healthy, non-convenience dinner quickly. Plus having to do dishes…twice. I’ve talked about that here; doing dishes twice when we get home. So not fun. So, yeah, I’m all over these one pot and one pan meals. I did a killer one pan meal this week. I can’t wait to share it! It’s so simple and so tasty. You’ll just have to stay tuned. But, back to this recipe. 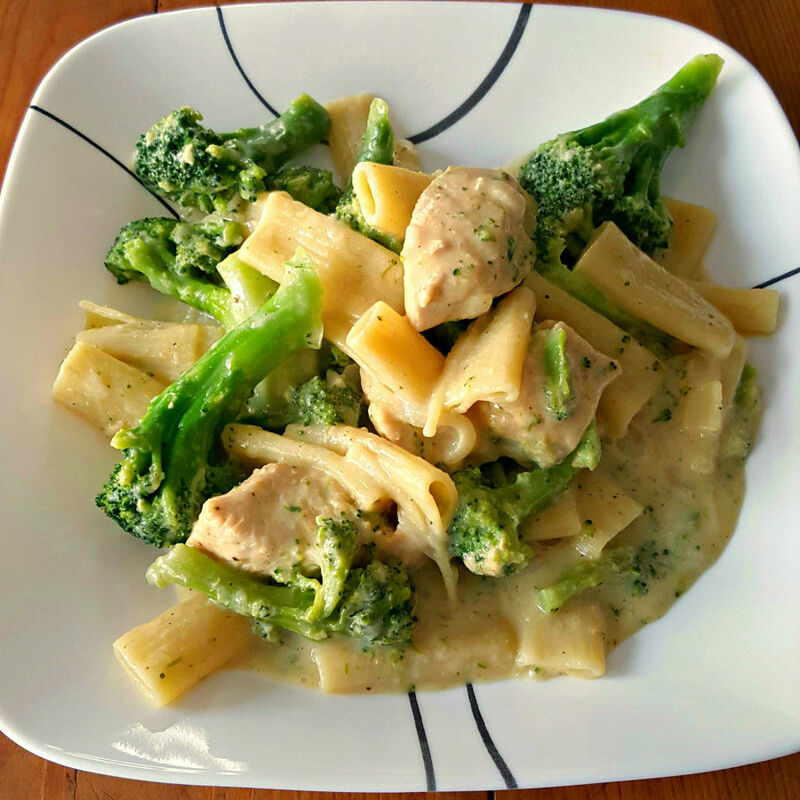 Not only is this quick, but it’s also delicious and it’s also pretty budget friendly to put on the table. Chicken is pretty inexpensive now; less so than beef. Frozen broccoli is just a little over a dollar a bag in my store. Pasta? Always cheap! Then it’s just cream cheese, cheese, herbs, spices, and broth. All staples in the kitchen. You can put this meal on the table and be comfortable that it’s not only healthy but not going to break your grocery budget. You can easily see how hearty this meal truly is. See those chunks of chicken? And those broccoli florets? They’re just swimming in that creamy, flavorful, cheddar sauce. It just takes me back to sitting around the dinner table growing up eating broccoli and cheese. It’s meals like this that truly take me back to the simpler times of being a kid. Don’t you wish you could do that sometimes? Go back to being a kid? I know I do. So, grab a fork, grab a napkin – cause you’re gonna need it – and dig in! This dish is so delicious your family will ask for it again and again. I can’t wait to make it again! Actually, I think I should add that to the menu this week! How did you eat broccoli growing up? Broccoli and cheddar is the perfect combination! 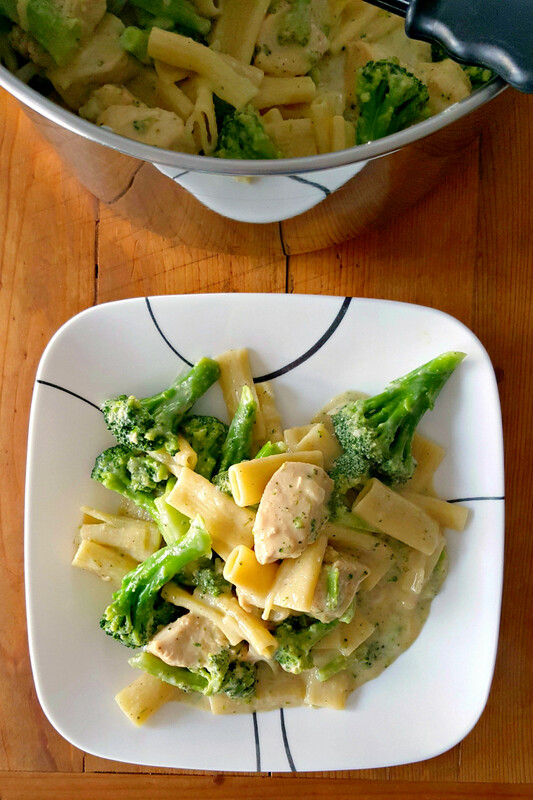 It’s also perfect in this Green and White One Pot Pasta aka Broccoli Cheddar Chicken Pasta; a one pot meal on the table super quick! Heat a large Dutch oven coated with cooking spray over medium-high heat and sauté the onions and garlic 1 minute or until fragrant. Add the chicken and cook until lightly browned. Stir in the next five ingredients (pasta through garlic power). Making sure the pasta is fully submerged, bring the broth to a full boil, and then reduce heat to low boil. Cook 10 to 12 minutes or until the pasta is cooked and most of the water has been absorbed. 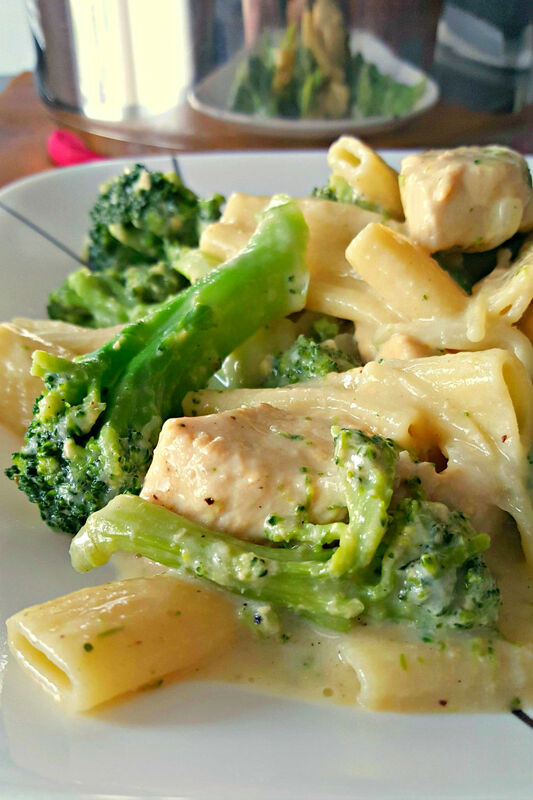 Using a whisk, stir in the cream cheese and cheddar until melted then fold in the broccoli and serve. Where does the milk go? That’s a typo in the body of the text. It should be cream cheese and not milk. Thank you! I can’t remember Mom ever serving broccoli . But I felt that way about cauliflower. It definitely had to be slathered with cheese. Now I love both any way. This is a wonderful combo that I would eat in a NY minute. Thank you, hun! Oh. I was the same with cauliflower. We just don’t eat as much of that now as we do broccoli.